Saudi Arabia is playing a dangerous game, writes Alastair Crooke. For weeks my colleagues and I heard stories that the Saudis were moving about 50 people around the country. It seemed a bad sign and that Saudi Arabia was preparing a mass execution. 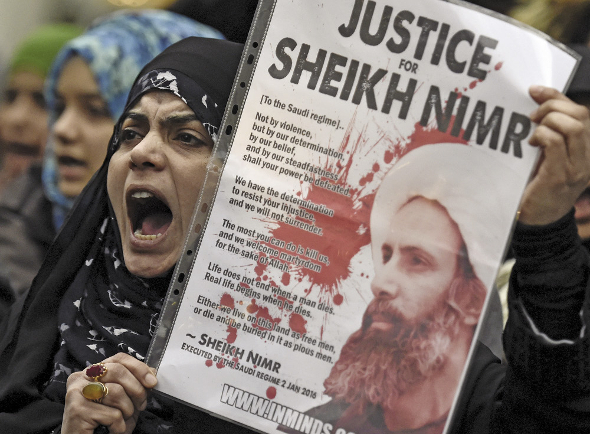 We usually heard one important name, Sheikh Nimr. He was a respected Shi’a preacher and the leader of the Shi’a of the Eastern Province of Saudi Arabia. He was a man who believed in nonviolence, and a supporter of the rights of Shi’a minorities in the Gulf. And so we thought that his execution would start a very big protest. The US and Iran had warned the Saudis of the possible risk of executing him. Then, in the New Year they executed forty-seven people, including Nimr, three other Shi’a political protesters, and 43 Sunni ‘al-Qaeda’ Saudi citizens. Of course the Saudi government knew the possible risk but they continued with the execution. The Saudis had thought about it as a political action because the Shi’a of the Eastern Province are not a problem for them. Most of them including Nimr, belong to the ‘quietest’ tradition of Shi’ism, associated with Iraq, and not Iran. The mass execution was for a number of different reasons .But it shows that someone can do dangerous things without thinking clearly when their world seems to be at an end. When an individual acts this way, it is terrible but when a state does this, it can be very dangerous. At the end of 2015 the German Intelligence Service, the BND, criticised Saudi Arabia and the king’s son who is making problems for the Arab world with the wars in Yemen and Syria. There are many problems for the Saudi leaders. The fall in the price of oil is one problem. It is also using its foreign money reserves quickly, the stock exchange is doing badly, and it is possible that the Saudi Rial will be devalued. There are also serious political problems. Ansar Allah (the Houthis), and their supporters have moved the war from Yemen to the three southern provinces of Saudi Arabia, which were a part of Yemen, and which the Yemenis now say they want to free. Every day they attack Saudi cities in the south and kill Saudi forces. The military situation is a real problem for the Saudi family leaders. It is clear that Mohammad bin Salman would like the Saudis to forget about the war, which he really started. But there are the other conflicts in which Saudi Arabia is involved. They all cost a lot of money to support, in Syria, Libya, Iraq, Egypt, and Lebanon. And perhaps this is why the German Intelligence Service criticised bin Salman as a risk taker. It seems that he wants to make Iran act in a way that will bring his Wahhabi friends and Sunni states together around him in a war against Iran. But this will not work. Iran understands the situation and wants to stay back. The real danger is that bin Salman is making himself into a Wahhabi supporter in a jihad or holy war against the ‘unholy’ Shi’a people of Iran, Iraq, Syria, and Lebanon. It may not result in a Sunni-Shi’a war in the region, but there is a different kind of danger. This is why the other 43 executions of Saudis are important. The ideas of ISIS are the same as those of Mohammad Abd al-Wahhab, who with Muhammad ibn Saud, founded the Saudi kingdom in the 18th century. The 18th century was, like today, a time of crisis in the Sunni world. And Abd al-Wahhab was shocked by what he saw as the terrible way of life in this world. And he thought their way of life was the reason for all Islam’s problems. He saw the world around him as against God. He believed that he must save Islam by fire, by burning it clean. He and Ibn Saud did exactly that. Thousands were killed, Islamic shrines were destroyed, and women and children were made slaves – all the way to Mecca and Medina. 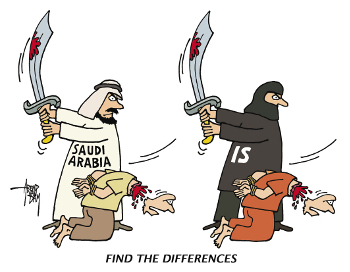 The ideas of ISIS are the ideas which founded Saudi Arabia. In fact, ISIS is closer to those early ideas than the Saudi Arabia leaders of today. ISIS thinks that today’s leaders of Saudi Arabia are losing those ideas with its ‘Western’ way of life. So bin Salman is taking a risk by supporting the early ideas of the Saudi jihadis against the ‘unholy’ Shi’a. Yes, it is a powerful way to contain Iran and get support at home. But it is a risk because the ideas of Wahhabi are really a part of modern Saudi society and can be used against today’s Saudi ‘modernizers’. So the execution of the ‘al-Qaeda’ prisoners was a warning that Wahhabi ideas are for those abroad but not for those at home. Perhaps the greatest Saudi fear is that US foreign policy, which moved to the Sunni side after the Iranian revolution, is changing back to the Shi’a. This is after the murders by the Wahhabi jihadists in Syria and Iraq and by Europe and the US using Sunni jihadism as a way to get what they want. The cost is clear: a terrible situation in the region, and the risk of millions of refugees entering Europe. Bin Salman wants to show us that he can make trouble and that we must take Saudi Arabia seriously. Alastair Crooke is the director of Conflicts Forum. He has 20 years’ experience working with Islamist groups in the Middle East and Asia and has helped to get ceasefires in the Occupied Territories.